We Love Photo Booth Questions! Do you print two photo strips? In less than ten seconds two individual 2X6 strips will print out so your guest can leave with one and you can keep one in a photo album. Our top of the line printers automatically and precisely separate the strips for you. Almost all other companies use less expensive printers that make you or an attendant manually cut them apart with a razor blade or scissors. Of Course! Unlimited Prints are included in all packages so the fun will never stop for your guests. Does it come with a Photo album guest book? All packages include double prints and a photo album that guests can simply slide their photos in and write messages by. This will provide you years of smiles every time you pick it up and look back at your friends and family caught in the act of fun. Can we customize a message or logo on each photo strip? Absolutely! For free we can print just about anything you want at the bottom of every photo strip. You are welcome to provide us with a custom logo, a personalized message, or we can just print the event name and date as well. We have a cocktail hour, then dinner, and then the party starts up again in another room. Can we have the booth off during dinner? Yes, we can setup the booth for cocktail hour then off dinner. Any booth downtime is charged as Idle Time at $40/hour. This downtime does not count towards your hours of unlimited photo use. Will a photo booth attendant be present at our event? Absolutely, our professional attendant will come dressed in formal wear and will setup/take-down the photo booth. They are there to ensure the photo booth runs to perfection and help your guests with scrap booking and any other questions they have. We require a $199 deposit in order to reserve your date, which is eligible for a full refund with in one week of purchase so you'll have time to discuss it with any other decision makers. How much room do you need for the photo booth? Our setup takes about 5ft x 6ft of space. For scrapbook events we will generally use a table from the event placed next to the booth for the activities. We take pride in offering the highest quality entertainment and photos at a fair price. You'll find lower quality at a lower price but when was the last time you bought the cheapest option and it didn't break? Saving 5-10% on a photo booth that doesn't work 50% of the time isn't a good deal. You spend so much time and money on your big day, don't gamble on a cheap photo booth that could stop working or ruin your great memories with blurry, poorly lit photos. Our equipment is the most expensive state of the art available and it will work wonderfully at your event guaranteed. Our prices are all inclusive so find out what you are not getting first from the less expensive companies. There are many excellent photo booth companies and we are competitively priced with them. However even the best of them can't offer full spectrum continuous lighting, high speed lab quality printers, or 18 mega pixel cameras. Photo Booths have been a hit at almost every kind of group celebration. Corporate Christmas parties, Fundraisers, Bar Mitzvahs, Quinceaneras, Birthday parties, Reunions, and of course Weddings. How far in advance to we have to book? We recommend booking it as soon as possible to ensure you reserve your date because our schedule fills up quickly. However, we never like saying no, so if we can make it happen for you we will. The photos print in approximately 10 seconds. Generally by the time you are out of the booth, the images have already printed. We already have a photographer, why do we need a photo booth? We get this question a lot! You absolutely need a photographer to take pictures of the event itself (mostly weddings), however the Photo Booth provides an unprecedented amount of entertainment for your guests. 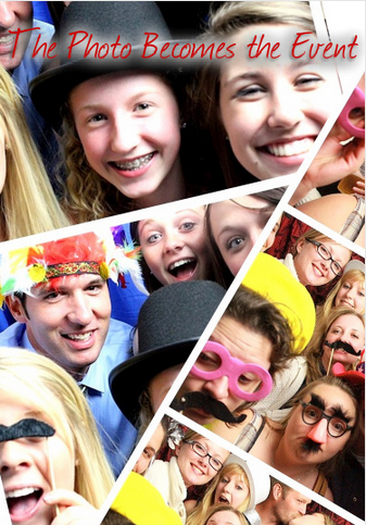 The Photo Booth allows your guests to let loose, be silly, and just have fun! The photos you keep from it are an incredible reminder of your fun event. When you see Grandma wearing a feather boa and blowing kisses into the camera, you will know it's a hit. We use a Lab Quality Sublimation Dye Printer. This means we give you exceptionally high quality photos that will last a lifetime. Don't be fooled by other companies that use Inkjet printers, they can smudge on your clothes, look grainy, and take up to a minute to print. How can we share the photos with our family and friends? We will upload all the photos to our online gallery where your friends and family can download them for free, tag them to Facebook, or order more prints easily.